Richard Brinsley Sheridan by Sir Joshua Reynolds. 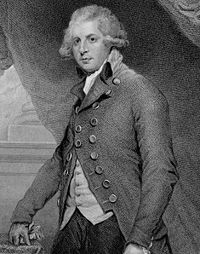 Richard Brinsley Sheridan (October 30, 1751 – July 7, 1816) was an Irish playwright and Whig statesman. His most famous plays, including The Rivals, The School for Scandal, and The Critic were popular throughout the eighteenth century and remain so today. They were known for their ingenious comedy which borrowed and amalgamated many devices from the English Restoration. Sheridan helped to perfect the comedy of manners that originated with Restoration playwrights such as George Etherege and William Congreve. The Restoration emerged as a reaction to the morally stern period of the Puritan government. Sheridan also participated in Parliament for Stafford, Westminster, Ilchester throughout his political career as well. He is said to have have paid the burgesses five guineas each for the honor of representing them, beside gifts in dinners and ale to the non-voting part of the community, for their interest and applause, which was reason enough for many of the public to vote for him. He was eventually in debt and disappointment in his later years. Sheridan died on July 7, 1816, and was buried with great pomp in Westminster Abbey. Sheridan was born in Dublin on October 30, 1751 at 12 Dorset Street, a fashionable street in the late eighteenth century. (Fellow playwright Sean O'Casey was born on Dorset Street 130 years later.) He was baptized on November 4, 1751; his father Thomas Sheridan was an actor-manager who managed the Theatre Royal, Dublin for a time, and his mother, Frances Sheridan, was a writer (most famous for her novel The Memoirs of Sidney Biddulph). She died when her son was fifteen. The Sheridans' eldest child, Thomas, died in 1750, the year when their second son, Charles Francis (d. 1806), was born. Sheridan was educated at Harrow School, and was to study law. There is a story, discredited by Mr. Fraser Rae, that Mrs. Sheridan on placing her sons with their first schoolmaster, Samuel Whyte, told him that she had been the only instructor of her children hitherto, and that they would exercise the schoolmaster in the quality of patience, "for two such impenetrable dunces she had never met with." One of those children was Richard Brinsley, then aged seven. At the age of eleven he was sent to Harrow school. Sheridan was extremely popular at school, winning somehow, Dr. Parr confesses, "the esteem and even admiration of all his schoolfellows;" he acquired, according to the same authority, more learning than he is usually given credit for. He left Harrow at the age of seventeen, and was placed under the care of a tutor. He was also trained by his father in daily elocution, and put through a course of English reading. He had fencing and riding lessons at Angelo's. After leaving Harrow, he kept up a correspondence with a school friend who had gone to Oxford. With this youth, N.B. Halhed, he concocted various literary plans, and between them they actually executed and published (1771) metrical translations of Aristaenetus. In conjunction with Halhed he wrote a farce entitled Jupiter, which was refused by both Garrick and Foote and remained in MS., but is of interest as containing the same device of a rehearsal which was afterwards worked out with such brilliant effect in The Critic. Some of the dialogue is very much in Sheridan's mature manner. Extracts given from papers written in the seven years between his leaving Harrow and the appearance of The Rivals—sketches of unfinished plays, poems, political letters and pamphlets—show that he was far from idle. The removal of the family to Bath in 1770-1771 led to an acquaintance with the daughters of the composer Thomas Linley. The eldest daughter, Elizabeth Ann Linley (b. 1754), a girl of 16, the prima donna of her father's concerts, was exceedingly beautiful, and had many suitors, among them Sheridan, N.B. Halhed and a certain Major Mathews. To protect her from this man's persecutions, Sheridan, who seems to have acted at first only as a confidential friend, carried out the romantic plan of escorting Miss Linley, in March 1772, to a nunnery in France. Sheridan returned and fought two duels with Mathews, which made a considerable sensation at the time. The pair had gone through a ceremony of marriage in the course of their flight, but Sheridan kept the marriage secret, and was sternly denied access to Miss Linley by her father, who did not consider him an eligible suitor. Sheridan was sent to Waltham Abbey, in Essex, to continue his studies, especially in mathematics. He was entered at the Middle Temple on the April 6, 1773, and a week later he was openly married to Miss Linley on April 3, 1773 at St Marylebone Parish Church. This marriage put to death such hopes of entering into a career in law, as they soon had a son, Thomas Sheridan. He was the only son of Richard Sheridan's by by his first marriage, and went on to become a poet of some merit. He then became colonial treasurer at the Cape of Good Hope. His daring start in life after this happy marriage showed a confidence in his genius which was justified by its success. Although he had no income, and no capital beyond a few thousand pounds brought into the marriage by his wife, he took a house in Orchard Street, Portman Square, furnished it "in the most costly style," and proceeded to return on something like an equal footing the hospitalities of the fashionable world. At this point, he began writing and producing plays to support himself and enhance his love for literature. Sheridan then began to negotiate with Garrick for the purchase of his share of Drury Lane, and the bargain was completed in June 1776. The sum paid by Sheridan and his partners, Thomas Linley and Dr. Ford, for the half share was £35,000 and of this sum, Sheridan contributed £10,000. The money was raised on mortgage, Sheridan contributing only £1300 in cash. Two years afterwards, Sheridan and his friends bought the other half of the property for £35,000. From the first, the direction of the theater would seem to have been mainly in the hands of Sheridan, who derived material assistance from his wife. Together, they produced a great number of plays in the theater. Tragically, in 1792, he lost his first wife, to whom he was devotedly attached. Details on the death remain unknown. He married again in 1795; his second wife was Esther Jane, daughter of Newton Ogle, dean of Winchester. The reminiscences of his son's tutor, Mr. Smyth, show anxious and restless family habits, curiously at variance with the accepted tradition of his imperturbable recklessness. After her death, he went on to marry Caroline Henrietta, née Callander (1779-1851). She became a successful writer in her own right, writing three novels. She received, after her husband's death, quarters at Hampton Court, and is described by Fanny Kemble as more beautiful than anybody but her daughters. The two of them produced three children, Helen Selina, Caroline, and the youngest, Jane Georgina. The eldest child, Helen Selina (1807-1867), married Commander Price Blackwood, afterwards Baron Dufferin. Her husband died in 1841, and in 1862 she consented to a ceremony of marriage with George Hay, Earl of Gifford, who died a month later. Her "Songs, Poems and Verses" (1894) were published, with a memoir, by her son, the marquess of Dufferin. The second daughter, Caroline, became Mrs. Norton (q.v.). The youngest, Jane Georgina, married Edward Adolphus Seymour, afterwards 12th duke of Somerset. In February 1777, Sheridan produced his version of Vanbrugh's Relapse, under the title of A Trip to Scarborough. This is printed among Sheridan's works, but he has no more title to the authorship than Colley Cibber to that of Richard III of William Shakespeare. His chief task was to remove indecencies, and therefore, he added very little to the dialogue. He went on to write numerous plays and produce other works from various authors. Sadly, his last years were harassed by debt and disappointment. In any attempt to judge of Sheridan as he was apart from his works, it is necessary to make considerable deductions from the mass of floating anecdotes that have gathered round his name. It was not without reason that his grand-daughter, Mrs. Norton denounced the unfairness of judging the real man from unauthenticated stories. The real Sheridan was not a pattern of decorous respectability, but it can be concluded that fairly believe that he was very far from being the Sheridan of vulgar legend. Against stories about his reckless management of his affairs we must set the broad facts that he had no source of income but Drury Lane theatre, that he bore from it for thirty years all the expenses of a fashionable life, and that the theatre was twice rebuilt during his proprietorship, the first time (1791) on account of its having been pronounced unsafe, and the second (1809) after a disastrous fire. Enough was lost in this way to account ten times over for all his debts. In December 1815, he became ill and was largely confined to bed. He died on July 7, 1816 in his home. Upon his death, Sheridan was buried in the Poets' Corner of Westminster Abbey. His funeral was attended by dukes, earls, lords, viscounts, the Lord Mayor of London, and other notables. Sheridan was a Whig politician, entering parliament for Stafford, in 1780 under the sponsorship of Georgiana, Duchess of Devonshire and friendship with Charles James Fox. Apparently he owed his election for Stafford to substantial arguments. He is said to have paid the burgesses five guineas each for the honor of representing them, beside gifts in dinners and ale to the non-voting part of the community, for their interest and applause. His first speech in parliament was to defend himself against the charge of bribery, and was well-received. He spoke little for a time and chiefly on financial questions, but soon took a place among the best speakers in the House, which recognized his services in opposing the war in America by offering him a gift of £20,000 which, however, he refused. Under the wing of Fox he filled subordinate offices in the short-lived ministries of 1782 and 1783. He was under-secretary for foreign affairs in the Rockingham ministry, and a secretary of the treasury in the Coalition ministry. In debate he had the keenest of eyes for the weak places in an opponent's argument, and the happy art of putting them in an irresistibly ludicrous light without losing his good temper or his presence of mind. In those heated days of parliamentary strife he was almost the only man of mark that was never called out, and yet he had no match in the weapon of ridicule. Sheridan found his great opportunity in the impeachment of Warren Hastings. His speeches in that proceeding were by the unanimous acknowledgment of his contemporaries among the greatest delivered in that generation of great orators. The first was on February 7, 1787, on the charges brought against Hastings with regard to the begums or princesses of the Oude. Sheridan spoke for more than five hours, and the effect of his oratory was such that it was unanimously agreed to adjourn and postpone the final decision till the House should be in a calmer mood. Of this, and of his last great speech on the subject in 1794, only brief abstracts have been preserved. However, with the second, the four days' speech delivered in his capacity of manager of the trial, in Westminster Hall, on the occasion so brilliantly described by Macaulay, posterity has been more fortunate. Gurney's verbatim reports of the speeches on both sites at the trial were published at Sir G. Cornewall Lewis' instigation in 1859, and from them people have been able to form an idea of Sheridan's power as an orator. There are passages here and there of gaudy rhetoric, loose ornament and declamatory hyperbole, but the strong common sense, close argumentative force and masterly presentation of telling facts enable us to understand the impression produced by the speech at the time. From the time of the break-up of the Whig party on the secession of Edmund Burke he was more or less an "independent member," and his isolation was complete after the death of Fox. When Burke denounced the French Revolution, Sheridan joined with Fox in vindicating the principle of non-intervention. He maintained that the French people should be allowed to settle their constitution and manage their affairs in their own way. But when the republic was succeeded by the empire, and it became apparent that France under Napoleon would interfere with the affairs of its neighbors, he employed his eloquence in denouncing Napoleon Bonaparte and urging the prosecution of the war. One of his most celebrated speeches was delivered in support of strong measures against the mutineers at the Nore. He was one of the few members who actively opposed the union of the English and Irish parliaments. When the Whigs came into power in 1806 Sheridan was appointed treasurer of the navy, and became a member of the Privy Council. After Fox's death he succeeded his chief in the representation of Westminster, and aspired to succeed him as leader of the party, but this claim was not allowed, and thenceforward Sheridan fought for his own hand. When the prince became regent in 1811 Sheridan's private influence with him helped to exclude the Whigs from power. Throughout his parliamentary career Sheridan was one of the boon companions of the prince, and his champion in parliament in some dubious matters of payment of debts. But he always resented any imputation that he was the prince's confidential adviser or mouthpiece. A certain proud and sensitive independence was one of the most marked features in Sheridan's parliamentary career. After a coolness arose between him and his Whig allies he refused a place for his son from the government, lest there should be any suspicion in the public mind that his support had been bought. His last years were harassed by debt and disappointment. He sat in parliament for Westminster in 1806-1807. At the general election of 1807 he stood again for Westminster and was defeated, but was returned as member for Ilchester, at the expense, apparently, of the prince of Wales. In 1812 he failed to secure a seat at Stafford. He could not raise money enough to buy the seat. He had quarreled with the Prince Regent, and seems to have had none but obscure friends to stand by him. As a member of parliament he had been safe against arrest for debt, but now that this protection was lost his creditors closed in upon him, and the history of his life from this time till his death in 1816 is one of the most painful passages in the biography of great men. His first comedy, The Rivals, was produced at Covent Garden on January 17, 1775. It is said to have been not so favorably received on its first night, owing to its length and to the bad acting of Sir Lucius O'Trigger. But the defects were remedied before the second performance, which was deferred to January 28, and the piece at once took that place on the stage which it has never lost. His second piece, St. Patrick's Day, or the Scheming Lieutenant, a lively farce, was written for the benefit performance (2nd of May 1775) of Lawrence Cinch, who had succeeded as Sir Lucius. In November 1775, with the assistance of his father-in-law, he produced the comic opera, The Duenna, which was played 75 times at Covent Garden during that season. Sheridan's farce, The Critic, was produced on October 29, 1779. In The Critic, the laughing infirmities of all classes connected with the stage—authors, actors, patrons and audience—are touched off with the lightest touch. The fun is directed, not at individuals, but at absurdities that grow out of the circumstances of the stage as naturally and inevitably as weeds in a garden. It seems that he had accumulated notes for another comedy to be called Affectation, but his only dramatic composition during the remaining thirty-six years of his life was Pizarro, produced in 1799– a tragedy in which he made liberal use of some of the arts ridiculed in the person of Mr. Puff. He also revised for the stage Benjamin Thompson's translation, The Stranger, of Kotzebue's Menschenhass und Reue. Sir Peter Teazle's ward, Maria, is courted by brothers Joseph and Charles Surface. Lady Sneerwell, a malicious gossip and founder of The School for Scandal, wants to marry Charles, and spreads false rumors about an affair between Charles and Lady Teazle in an attempt to make Maria reject Charles. Meanwhile, Joseph is attempting to seduce Lady Teazle in order to win her favor, and thus the favor of Sir Peter, which will serve his interests with Maria. The brothers have a rich uncle, Sir Oliver, whom they have not seen in 16 years, and who visits them both incognito to test their characters before deciding which of them shall inherit his fortune. At first shocked by Charles' profligacy, he cannot help but like the charming younger brother, Joseph. However, when he discovers that Joseph is a sanctimonious hypocrite, he prefers Charles. In a farcical scene involving characters hiding behind furniture, entitled "the screen scene," Sir Peter learns of the plotting between Joseph and Lady Sneerwell, that the rumors about Charles and Lady Teazle are false, and that his wife is merely a victim of Joseph's flattery. He is therefore reconciled with his wife, and decides that Charles deserves to marry Maria. Lady Teazle, who has had a narrow escape from ruin, delivers an epilogue warning of the dangers of scandal-making. Throughout the play, Sheridan sticks to the comedy of the Restoration period, while still maintaining values of love and devotion, and condemning the deceitful ways of adultery, which the Restoration often praised. The School for Scandal was produced on the May 8, 1777. Mrs. Abington, who had played Miss Hoyden in the Trip, played Lady Teazle, who may be regarded as a Miss Hoyden developed by six months' experience of marriage and town life. The lord chamberlain refused to license the play, and was only persuaded on grounds of personal friendship with Sheridan to alter his decision. There are tales of the haste with which the conclusion of The School for Scandal was written, of a stratagem by which the last act was got out of him by the anxious company, and of the fervent "Amen" written on the last page of the copy by the prompter, in response the the author's "Finished at last, thank God!" But, although the conception was thus hurriedly completed, it is clear from Sheridan's sister, that the idea of a "scandalous college" had occurred to him five years before in connection with his own experiences in Bath. His difficulty was to find a story sufficiently dramatic in its incidents to form a subject for the machinations of the character-slayers. He seems to have tried more than one plot, and in the end to have desperately forced two separate conceptions together. The dialogue is so brilliant throughout, and the auction scene and the screen scene so effective, that the construction of the comedy meets with little criticism. The School for Scandal, though it has not the unity of The Rivals, nor the same wealth of broadly humorous incident, is universally regarded as Sheridan's masterpiece. He might have settled the doubts and worries of authorship with Puff's reflection: "What is the use of a good plot except to bring in good things?" The School for Scandal continued to draw larger houses than any other play every time it was put on the stage throughout the entirety of Sheridan’s life. Sir Peter. Odds, here he is! Charles: Surfac:. Lady Teazle, by all that’s wonderful! Sir Peter: Lady Teazle, by all that’s damnable! Charles Surface: Sir Peter, this is one of the smartest French milliners I ever saw. Egad, you seem all to have been diverting yourselves here at hide and seek, and I don’t see who is out of the secret. Shall I beg your ladyship to inform me? Not a word!—Brother, will you be pleased to explain this matter? What! is Morality dumb too?—Sir Peter, though I found you in the dark, perhaps you are not so now! All mute! Well—though I can make nothing of the affair, I suppose you perfectly understand one another; so I’ll leave you to yourselves.—[Going.] Brother, I’m sorry to find you have given that worthy man grounds for so much uneasiness.—Sir Peter! there’s nothing in the world so noble as a man of sentiment! This excerpt partially concludes the "screen scene" in the play, which has been made one of the most famous scenes in all of English literature. In such, Lady Teazle disguises herself behind a screen to ensure that her husband does not find her out, as she has traveled to Charles Surface's house to have an affair with him. Of course, her husband, Sir Peter eventually discovers her, resulting in an honest and tender scene between the two, which was rarely even seen in Restoration plays. This demonstrates the importance of the marriage in Sheridan's play, as he transforms it into characterization instead of mere plot device. Having quickly made his name and fortune, Sheridan bought a share in Theatre Royal, Drury Lane. His most famous play The School for Scandal (1777) is considered one of the greatest comedies of manners in the English language. It was followed by The Critic (1779), an updating of the satirical Restoration play The Rehearsal, which received a memorable revival (performed with Oedipus in a single evening) starring Laurence Olivier at the Old Vic Theatre in 1946. His plays continue to be performed and taught in London and throughout the world. He also wrote a selection of poems and political speeches for his time in parliament. Moore, Thomas. Memoirs Of The Life Of Right Honorable Richard Brinsley Sheridan. Kessinger Publishing, June 30, 2004. ISBN 1419133780. Foss, Kenelm. Here lies Richard Brinsley Sheridan. Folcroft Library Editions, 1973. ISBN 0841412502. Jordan, Thomas H. The theatrical craftsmanship of Richard Brinsley Sheridan's The school for scandal. Revisionist Press, 1974. ISBN 0877002053. Sheridan, Richard Brinsley. The Dramatic Works Of Richard Brinsley Sheridan. Kessinger Publishing, LLC, October 31, 2006. ISBN 1430451483. History of "Richard Brinsley Sheridan"
This page was last modified on 11 July 2015, at 22:26.